Governor Kashim Shettima on Tuesday led key stake-holders and elders from Chibok ‎community to the DSS Medical Centre where the Governor’s delegation met with the 82 schoolgirls freed by Boko Haram three years after their violent abduction at Government Secondary School, Chibok, Borno State in April, 2014. The Governor’s wife, Nana Shettima was also at the centre to meet the girls. Shettima’s delegation included the District head of Chibok, prominent elders, Senator Mohammed Ali Ndume representing Borno South, lawmakers at the House of Reps and Borno State Assembly representing Chibok and other Government officials from Chibok community. The Governor was received by the Minister of Women Affairs, Mrs Jummai Alhassan and the Chief Medical Director of the Department of State Services Medical ‎Centre, Mrs Ann Okorafor. Excited Minister of Women Affairs, Mrs Jummai Alhassan revealed that although the 21 girls freed by the insurgents in October, last year, have been under the ‎custody of the Federal Government and undergoing rehabilitation, Governor Kashim Shettima has been making financial contributions to the Federal Ministry of Women Affairs to co-fund the rehabilitation and skills acquisition programmes. “The people of Borno State are lucky to have a compassionate Governor who cares deeply and genuinely for his people. The 21 girls freed last year are under the Federal Government but Governor Shettima said these girls are his daughters, they are citizens of Borno and as such he was still going to be making contributions so that whatever we planned as Federal Government could be improved upon and he has been supporting us. “He offered support without us asking and I am sure he will still support us in managing our 82 daughters by the time they ‎leave this hospital and come to us” the Minister said. Governor Shettima told the girls that he was so full of joy and looks forward to receiving their remaining counterparts still being held. “By the grace of God your sisters will be also be freed. We have a determined President, all we need is to support him and pray for him. I assure you that we shall do whatever we can to make you not only comfortable but to actualize your dreams of becoming whatever you wanted while in school. 56 of your colleagues who escaped from abduction are in their final year in two international private schools. “They are doing very well. We will work with the Federal Government and your parents to determine what is best for you. For now, the focus is on your health. “I will urge you to cooperate with the physicians here. Please, do not hide anything from them, they are trained to keep your medical records confidential and the information you give them is what they need to assess your health. “When your health assessment is completed, we will then discuss your education but please, do not allow your experience make you give up on education” Shettima said. 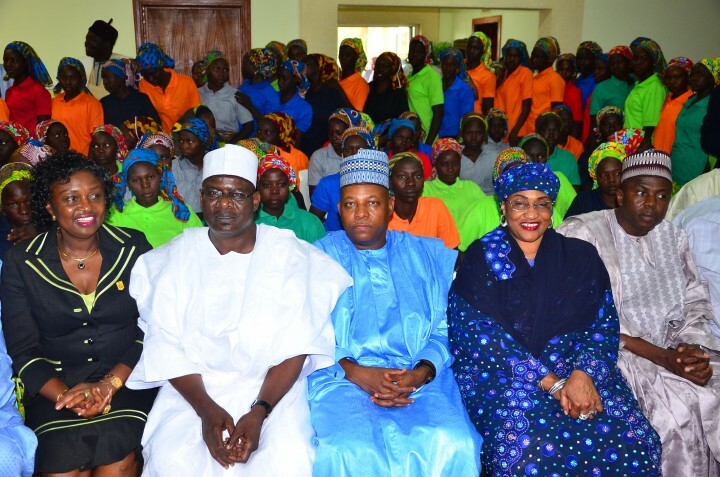 The Senator Mohammed Ali Ndume and representative Asabe Vilita Bashir, both representing local government areas that include Chibok addressed the girls separately, thanking God for their return and calling on them to par for the return of others still in captivity. 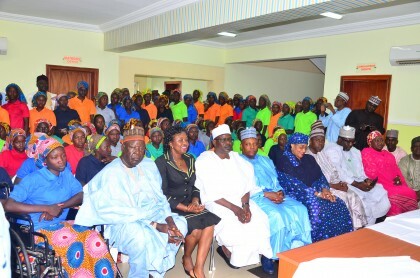 The District head of Chibok, the member representing Chibok at the Borno State Assembly as well as other stake-holders ‎from the community took time to speak to the girls in local languages to connect with their emotions. “They all all praised God for their return and called on them to cooperate with physicians at the DSS Medical Centre. Mrs Shettima’s with, Nana Shettima presenting boxes of clothing to each of the 82 girls as part of contributions to uplift their spirit. The Governor’s wife, who made several off camera visits to see the first set of 21 girls is expected to step up visits as the 82 girls undergo rehabilitation.